Our backyard pool holds 10,000 gallons. Its average depth is 4 feet deep and it is 10 feet long. If there are 7.48 gallons in a cubic foot, how wide is the pool? A cube has a volume of 64cm3. 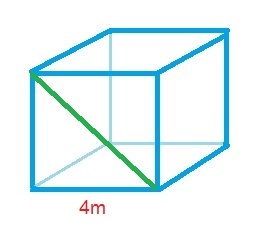 What is the area of one side of the cube? The cube has a volume of 64cm3, making the length of one edge 4cm (4 * 4 * 4 = 64). where is the length of the edge of a cube. What is the length of an edge of a cube that has a surface area of 54? Find the length of the diagonal connecting opposite corners of a cube with sides of length . This diagonal is now the base of a new right triangle (call this ). The height of that triangle is an edge of the cube that runs perpendicular to this diagonal (call this ). The third side of the triangle formed by and is a line from one corner of the cube to the other, i.e., the cube's diagonal (call this ). Use the Pythagorean Theorem again with the triangle formed by , , and to find the length of this diagonal. The length of the diagonal is . What is the surface area of a cube with a side length of 15? To find the surface area of a cube we must count the number of surface faces and add the areas of each of them together. In a cube there are 6 faces, each a square with the same side lengths. Our answer for the surface area is . What is the surface area of a cube with a side length of ? To find the surface area of a cube, we must count the number of surface faces and add the areas of each together. 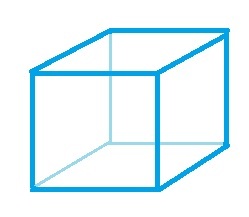 In a cube there are faces, each a square with the same side lengths. In this example the side length is . The area of a square is given by the equation . Using our side length, we can solve the area of once face of the cube. We then multiply this number by , the number of faces of the cube to find the total surface area. James Madison University, Bachelors, English. James Madison University, Masters, Secondary Education.